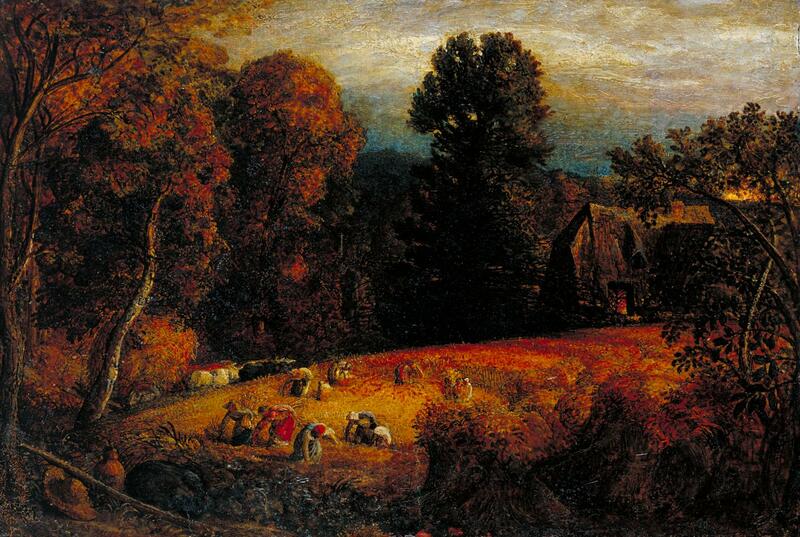 The nineteenth-century artist who was most influenced by Blake and his work is Samuel Palmer (1805–1881). Although much less well-known that JMW Turner or the Pre-Raphaelites, Palmer had quite a long career, painting very distinctive landscapes which have proved influential on twentieth century art. I hope to show that they are original and beautiful too. Palmer was born in London just after the start of the Napoleonic Wars. He was a precocious artist, and by the time that he was fourteen, he had three paintings accepted for exhibition by the Royal Academy. This compares with the famously-precocious JMW Turner, who was fifteen when he had his first work accepted. Unlike Turner, though, Palmer never studied at the Royal Academy Schools. Because success in the Schools and at the Royal Academy had a very poor link with a successful artistic career, Palmer resolved that he would avoid what he saw as ‘the pit’ of the Academy and London’s contemporary art scene, and pursued a more independent course. He received some private tuition from the obscure William Wate, but for the most part, Palmer seems to have been self-taught with the aid of advice and criticism from friends and contacts. Samuel Palmer (1805–1881), At Hailsham, Sussex: a Storm Approaching (1821), watercolor and graphite on medium, slightly textured, medium wove paper, 43.8 x 59.7 cm, Yale Center for British Art, New Haven, CT. Wikimedia Commons. 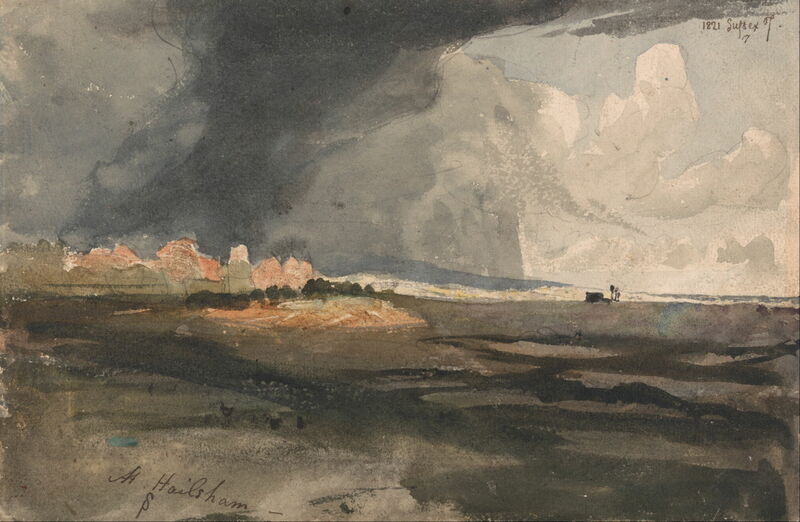 Remarkably, some of his earliest paintings have survived, including At Hailsham, Sussex: a Storm Approaching (1821), a powerful watercolor sketch. From this he seems to have made a finished oil painting, which was exhibited at the British Institution the following year. This shows Palmer’s increasing interest in the effects of light, no doubt inspired by JMW Turner. When still learning his trade, Palmer adopted the young but experienced painter John Linnell as his mentor, who in turn introduced him to William Blake, and to the works of the late Gothic and early Renaissance. Palmer was also influenced by Henry Fuseli, and studied the collection of Old Masters at London’s Dulwich College, and a private collection of ‘primitive’ paintings in London, including a copy of a wing of van Eyck’s Ghent altarpiece. These drew Palmer towards what was then considered to be ‘primitive’ art, rather than the more contemporary styles which had been fostered by the likes of Joshua Reynolds. Palmer’s weakness lay in his lack of training in the figure, a topic which he would have learned at the Royal Academy Schools. He set his early aim as showing how nature and the material world were a portal for his higher artistic and spiritual vision, which was at odds with Linnell’s faithful transcription of the material world, but closer to Blake’s visionary work, and to the goals of the Romantic movement. His first concerted expression of his artistic vision came as early as 1825, when he painted a series of six densely-worked sepia landscapes now known as the Oxford Sepias, in the Ashmolean Museum, Oxford (whose images are frustratingly not available for inclusion here). That same year, Palmer inherited sufficient money to provide him with security and independence for some time to come. He then joined an artistic brotherhood known as The Ancients, with George Richmond, Edward Calvert, Frederick Tatham, the engraver Welby Sherman (who later engraved some of Palmer’s paintings) and others. Like the later Pre-Raphaelite Brotherhood (PRB), it aimed to return to older and ‘purer’ styles, but unlike the PRB The Ancients did not succeed in changing the direction of British painting, and its members are now largely forgotten. In 1826, Palmer moved to the rural village of Shoreham in Kent, in the valley of the River Darent to the north of Sevenoaks, where he spent much of the next decade producing some of his most distinctive work. This was well before the Barbizon School in France made this strategy of living in the country a popular choice for painters. For Palmer, the village and its environs became his ‘land of milk and honey’, in the Biblical vision of Beulah. Samuel Palmer (1805–1881), Oak Trees, Lullingstone Park (1828), pen, brush, brown Indian ink, graphite, watercolor, gouache and gum arabic on wove paper, 29.5 × 46.8 cm, National Gallery of Canada, Ottawa. Wikimedia Commons. Palmer still painted some fairly conventional works during his Shoreham period, such as the finely-detailed Oak Trees, Lullingstone Park (1828). This shows ancient oaks in the deer park of Lullingstone Castle, in the Darent Valley of Kent, between Eynsford and Shoreham. it was painted at the instigation of his mentor Linnell, who was trying to get Palmer to paint more directly from nature. He lived alone in a tumbledown cottage in Shoreham, without a wife or partner, and was remote from the other Ancients and his mentor Linnell. Samuel Palmer, Cornfield and Church by Moonlight (c 1830), black ink on paper, 15.2 x 18.4 cm, Yale Center for British Art, New Haven, CT. Wikimedia Commons. 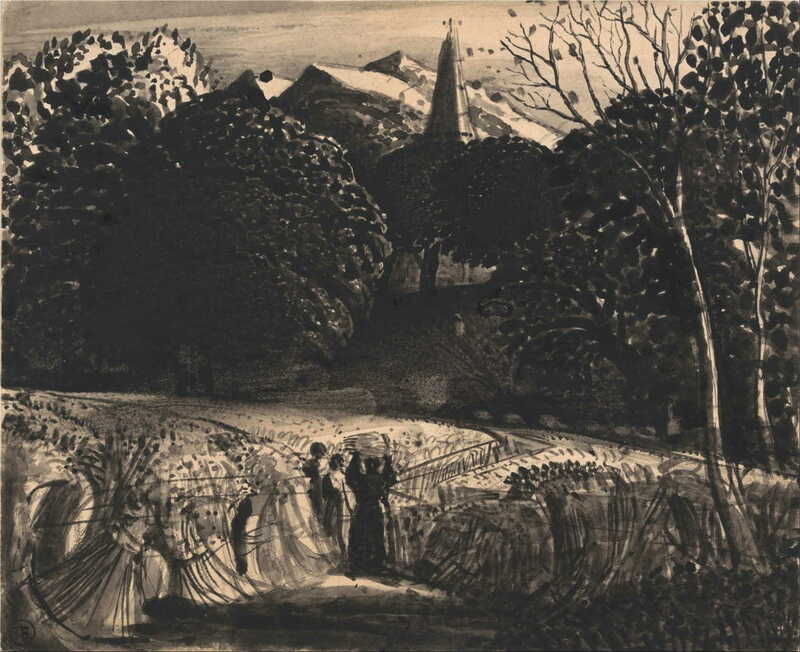 With the Oxford Sepias as his starting point, many of his early works in Shoreham are local views, such as this ink drawing of Cornfield and Church by Moonlight (c 1830). 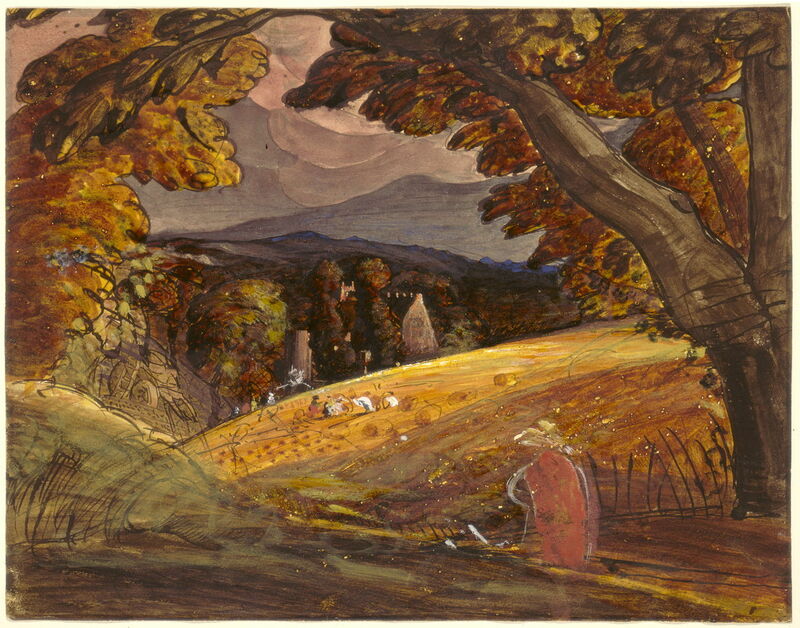 Samuel Palmer (1805–1881), Harvesters by Firelight (1830), pen and black ink with watercolor and gouache on wove paper, 28.7 x 36.7 cm, The National Gallery of Art (Paul Mellon Collection), Washington, DC. Courtesy of The National Gallery of Art. From these he developed his characteristic golden watercolours seen in Harvesters by Firelight (1830). 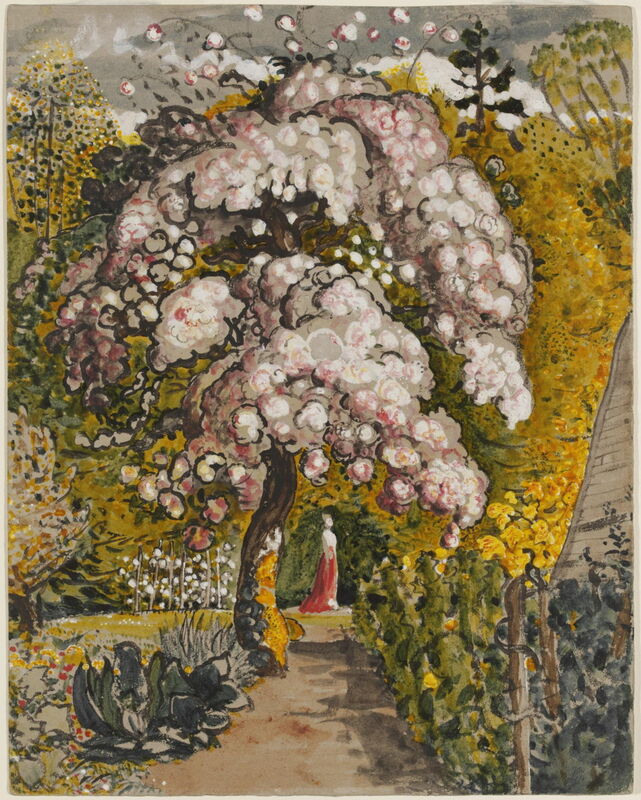 Samuel Palmer (1805–1881), In a Shoreham Garden (c 1830), watercolour on paper, dimensions not known, Victoria and Albert Museum, London. Image courtesy of and © Victoria and Albert Museum, London. When the fruit trees came into flower, he captured their blossom exuberantly, as In a Shoreham Garden (c 1830). 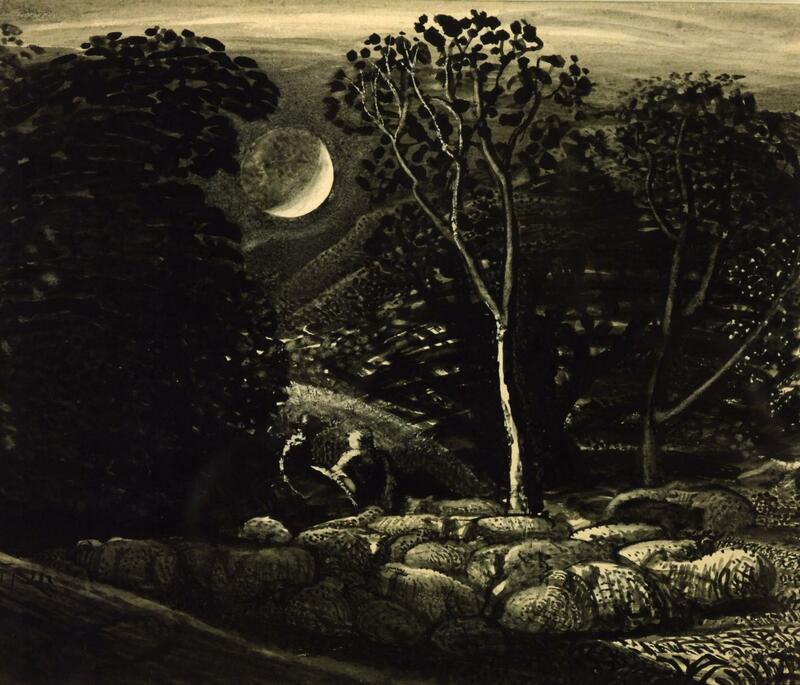 But it was his drawings and paintings of twilight and night which best showed his vision of an enchanted countryside, as in Moonlight, a Landscape with Sheep, from one of his Shoreham sketchbooks (c 1831-33). 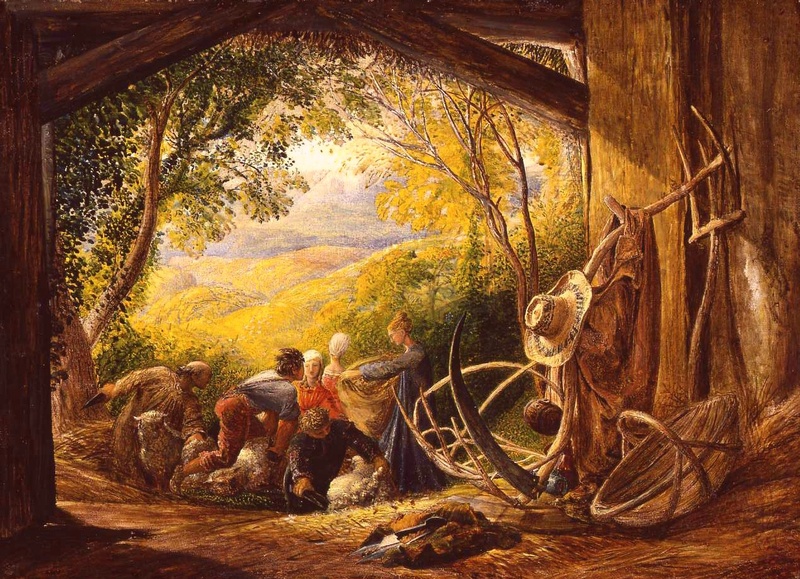 The Gleaning Field (c 1833) shows the local poor who have moved in, once the harvest has been completed, to gather any remains that they can salvage to feed their families. 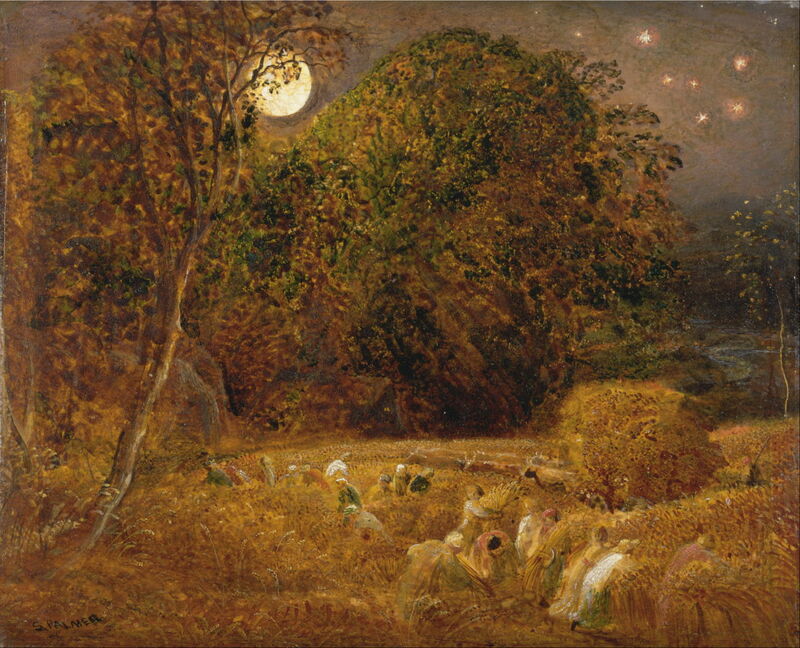 The Harvest Moon (c 1833) is an oil sketch on paper which is one of the best of his paintings from the Shoreham period. It shows local village people, predominantly women, cutting the ripe crop in the traditional way, forming it into stooks, which are then taken away in the cart, still drawn by oxen. The combination of golden corn and moonlight transforms the scene with a deep enchantment. 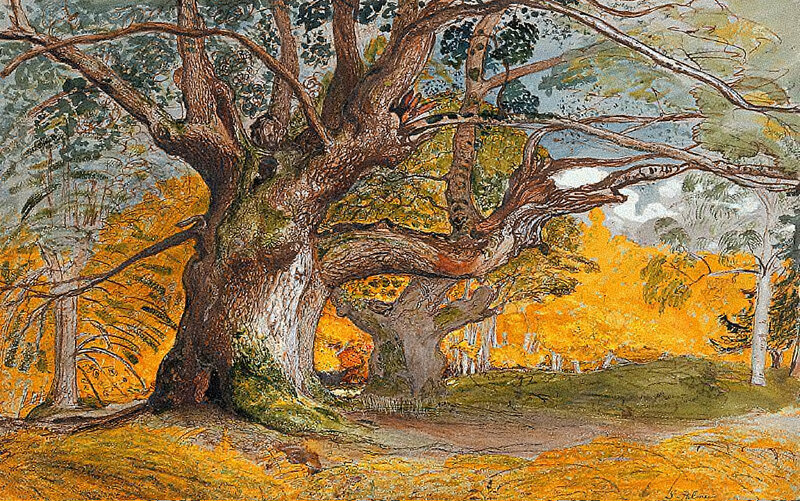 Samuel Palmer (1805–1881), The Timber Wain (1833-34), watercolor and gouache on medium, smooth, cream wove paper, 40 x 52.7 cm, Yale Center for British Art, New Haven, CT. Wikimedia Commons. From about 1830, he seems to have got out of the village more, and walked up the nearby downs to paint views from the rolling hills looking over the Weald of Kent, such as The Timber Wain (1833-34). Here a team of oxen is being used to draw a heavy wagon bearing a huge tree trunk down to the village in the valley. 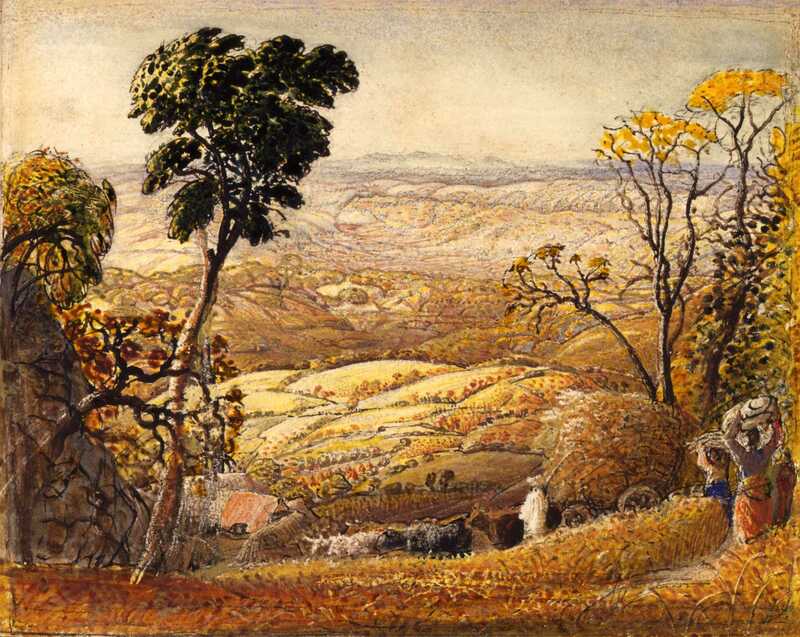 Samuel Palmer, The Weald of Kent (c 1833-4), watercolour and body-colour, 18.7 x 27.1 cm, Yale Center for British Art, New Haven, CT. Wikimedia Commons. 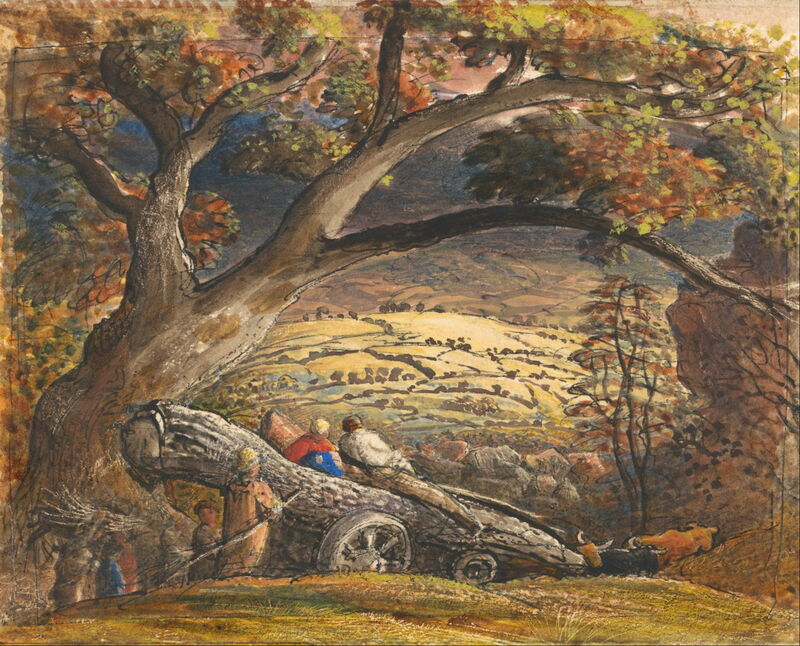 The Weald of Kent (c 1833-34) is a similar watercolour using the repoussoir of the trees to frame the distant view beyond. Samuel Palmer, The Golden Valley (c 1833-4), watercolour and gouache, 12.7 x 16.5 cm, Private collection. WikiArt. 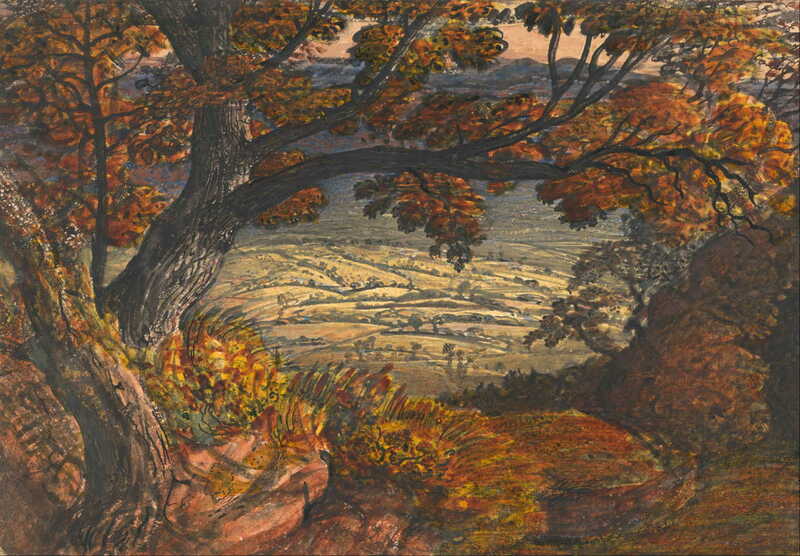 Towards the end of his time in Shoreham, Palmer’s views started to open out into more conventional landscapes, such as The Golden Valley (c 1833-34). Samuel Palmer, The Shearers (c 1833-5), oil and tempera on wood, 51.4 x 71.7 cm, Private collection. WikiArt. The Shearers (c 1833-35) is the most ambitious of his works from this period. He still used a tempera underpainting in conformance with the aims of The Ancients, but here makes the modern concession of painting with oils on top. This shows the seasonal work of a shearing gang, in a sophisticated composition which draws the gaze to the brilliant and more distant view beyond. The curious collection of tools to the right was the subject of preparatory sketches, and seems to have been carefully composed. However they have defied any symbolic interpretation, and may just ‘look right’. The timelessness and rural peace shown in Palmer’s Shoreham works was not an accurate reflection of the more worrying changes which had been taking place in the countryside. There was strife in the rural economy, peasant protests, and Palmer unwisely dabbled in local politics. When he benefitted from another legacy, he found himself with sufficient funds to buy a house in Paddington. In 1835, he left Shoreham and returned to London. Posted in General, Painting and tagged Ancients, Blake, landscape, Linnell, painting, Palmer, Turner. Bookmark the permalink.